Wallaby is a nocturnal animal whose physical appearance is similar to kangaroo. Wallaby is smaller than kangaroo. It lives in the lowland rainforest of Sorong regency. This marsupial animal eats leaves of green plants that grow in the forest of New Guinea. However, local people say that they find leeches inside the intestine and stomach of the animal. Perhaps, a lot of leeches that crawl on the leaves are also chewed together with the leaves and swallowed by wallaby. It is a good source of protein for the animal. Villagers hunt them for their meat. 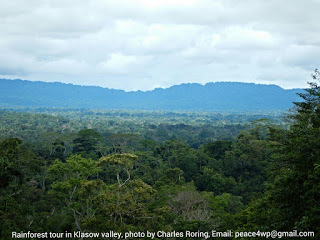 As the number of visitors who go to Klasow Valley increases every year, wallaby has been included in the list of animals which can be seen in the forest. Although local villagers have curb their hunting activities, hunters from Sorong city still enter the jungle of the valley to look for the animal. 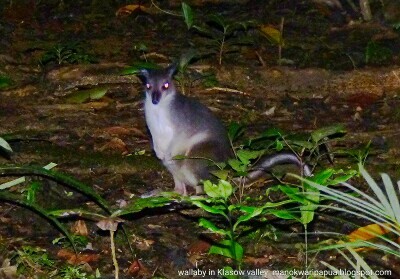 To see wallaby, visitors need to do a night walk in the jungle. As a tour guide, I have organized a lot of Birding Tours in Lowland Forest of Sorong where participants can watch various species of tropical birds and also do night walk in the jugle to see wallaby. Local villagers will guide you in the jungle during the night walk. In addition to wallaby, other animals which you may see are snakes, nocturnal insects, deer, and fruitbats. Wear trekking boots or sport shoes. During the rainy season, the path in the lowland area is full of mud. It will slow down the walking speed and cause unpleasant walking experience. In this case, a pair of jungle boots made of rubber is better and ordinary sport shoes.